Let’s mark the advent of the Europa League with a bit of UEFA bashing. I’ve written a lot recently about the need for top down change to get Scottish football moving forward again. Well, incompetence reaches higher than even the ivory towers of Hampden. After a shocking start last night Arsenal got themselves out of jail thanks to a winner from Eduardo. Yes, the same Eduardo that UEFA had suspended only to change their mind and let him off. They had their reasons but, to quote Boris Johnson, they were nothing more than an "inverted pyramid of piffle." To the outside looking in UEFA jumped into a decision after the outcry in Scotland. Realising this was a kneejerk reaction likely to offend a big club in a big league they waited a week or two then backed down. That, my friends, is leadership. An effective to rid the game of diving. Certainly not. An ideal illustration of UEFA’s ongoing incompetence. Why, of course. 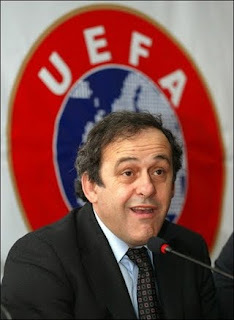 And its not just UEFA. FIFA ban Chelsea from making signings because of charges relating to what FIFA seemed to think was little more than child trafficking. That opens a can of worms that might well end up with nine or ten (at least) of Europe’s biggest clubs in the same position as Chelsea. Will FIFA see this through? I’d find that highly unlikely. Rather, I think, we’ll see the Chelsea ban dropped in February and all other cases closed after the offending club ups the compensation to the club with the complaint. FIFA will say no more. Again this is not governing the game. This is a bloated, corrupt organisation refusing to do anything so scared and blinded is it by the glamour of the world’s biggest football clubs. For the record I don’t think Celtic were right to make such a song and dance about Eduardo. Given the football lesson Arsenal had handed out Celtic should have shut up and slipped quietly over Hadrian’s Wall. But after UEFA had acted they had to stand by their decision. Their see-saw decision making has made the issue of diving murkier still. Is that the right way to govern a global game? The unsightly rush to sign children to top clubs is worrying and morally questionable. It is moving football ever closer to the model of US baseball in the Latin America. Anyone who thinks this is a good thing would do well to read Dave Zirin’s Welcome To The Terrordome. But, yet again, I don’t see FIFA having the courage of their convictions. Clubs will get cleverer at circumventing the rules and payments will increasingly buy silence as much as they buy potential superstars. And the game’s governing bodies will stand idly by. Too weak, too corrupt and too much in love with the big money to do anything. And what little soul football has left will be increasingly tarnished. Rant 3: TV or not TV? Europa League: A eureka moment?